Author(s) Garling, D. J. H.
A large part of mathematical analysis, both pure and applied, takes place on Polish spaces: topological spaces whose topology can be given by a complete metric. This analysis is not only simpler than in the general case, but, more crucially, contains many important special results. This book provides a detailed account of analysis and measure theory on Polish spaces, including results about spaces of probability measures. Containing more than 200 elementary exercises, it will be a useful resource for advanced mathematical students and also for researchers in mathematical analysis. 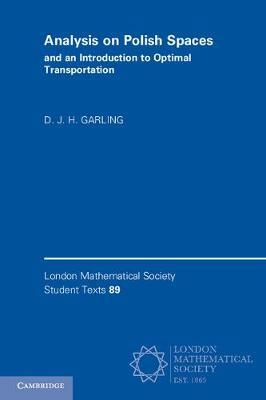 The book also includes a straightforward and gentle introduction to the theory of optimal transportation, illustrating just how many of the results established earlier in the book play an essential role in the theory.